This song is from the 1960 film High Time and starred Bing Crosby, Fabian and Tuesday Weld. 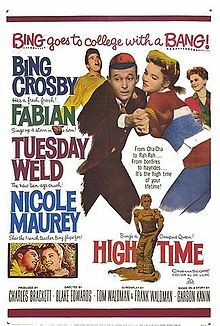 In the film, Bing Crosby decides to go back to college (at the age of 51) and experiences the generation gap first-hand. But he wins everyone over and gets his degree, having a great time along the way, including falling in love with his French professor. Bing Crosby introduced “The Second Time Around” in the movie. Who can say what led us to this miracle we’ve found? “The Second Time Around” was recorded on December 27, 1965 and released in 1966 on The Movie Song Album. It was arranged by Al Cohn.